On June 2, 2017, the DCCC Adult Learning Center graduated seventeen students from their GED prep and high school Equivalency programs. Students received their Kansas High School diplomas in the Little Theatre on the DCCC campus. A former graduate of the program, Juan Guerrera, gave the address, encouraging students to inspire those who follow. Over one hundred friends and family celebrated with students at a short reception after the ceremony. Students enrolled in classes at the ALC have often stopped attending school at various grades and for various reasons. Those students are tested to assess their individual skill levels so that a course of study may be determined. The students then attend classes to review skills they learned in school and/or to acquire new skills needed to pass the GED test. The GED consists of four batteries of tests: math, language arts, social studies, and science. Preparing for and taking the tests can be an arduous journey for many. 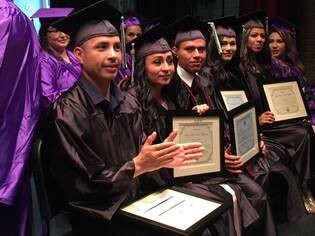 They’re entrenched in family and work obligations and GED classes are one more commitment in an already busy schedule. Many students find themselves in unpromising situations and see the GED as a way to change a past decision. Whatever the reason, these students put forth time an effort to do what it takes to pass the test – a test that only 60% of graduating high school seniors can pass. To date, Kansas has an over-all pass rate of 83%, although many testers re-take some tests. All of these new graduates are looking to the future with plans both large and small. Some are heading to college and some are satisfied simply to complete what was started long ago. Some students left high school with only a year or two left, but the ALC and HEP has several students who never made it to high school. This credential is a milestone on a very long road. Dodge City Community College Adult Learning Center is very proud to hold up these graduates in celebration and looks forward to seeing their continued contribution to the community, as well.